The 2013 GMC Sierra pickup will have best in class V8 fuel economy. When General Motors announced this today in a press release it didn’t raise many eyebrows. However, GMC also makes the bold claim that this pickup truck also gets better fuel economy than it arch rival, the Ford F-150’s EcoBoost V6. The New Sierra can achieve an EPA estimate 16 mpg city and 23 highway in 2WD form, and an estimated 16 / 22 in 4WD. GM’s new 5.3 liter V8 found in the GMC Sierra features fuel saving cylinder deactivation technology. This limits the number of cylinders required to be in use during certain, low load situations. For example, during highway cruising. The power of this V8 is up significantly since last year to 355 horsepower and 383 pound-feet of torque. The engine enables the Sierra to tow up to 11,500 pounds, the same amount that the Ford F-150 EcoBoost is capable of in the Ford F-150. 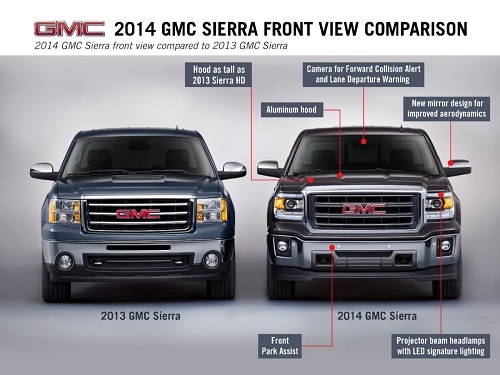 Tony DiSalle, vice president of GMC Marketing commented on this saying, “In the core of the full-size truck market, the 2014 Sierra is second to none. Truck owners expect durability, capability and fuel efficiency, and this latest generation of our proven V-8 is designed to deliver on those expectations.” Mr. DiSalle is right and he is also correct in not including the V8 in what customers expect. Ford has without a doubt changed some perceptions with its EcoBoost V6 in the F-150. Although the Chevy does have very slightly better fuel economy in certain comparable models, the Ford F-150 has the torque edge in those matchups with 420 foot-pounds of twist at a very low 2500 RPMs. In a pickup truck, the driver does not normally rev the engine far into the tachometer’s upper ranges. Unlike in a sports car, a truck driver expects the pull to be from the lower ranges, so a turbo has some advantages. However, turbos also have a reputation for doing better on the EPA test cycle than in real world driving. One thing is for certain, cylinder deactivation, direct injection and turbocharging all have benefits regardless of the cylinder count in the engine. What manufacturers have done is set up a sort of false choice claiming that turbos do better fuel economy-wise and offer the same power as an engine with more cylinders. When the engines are both modern, the results usually tip in favor of the bigger engine with more cylinders. For example, in a recent story we compared Hyundai’s Santa Fe Sport with a 2.0 turbo to its larger Santa Fe, which is a larger vehicle with a V6. They had almost identical fuel economy, despite the larger vehicle having more cylinders, and the V6 is more powerful. Similarly in other stories we have compared the Acura RDX with V6 power to its rivals that have 4 cylinder engines. Its fuel economy is similar, particularly on the highway, and the power is simply in another dimension. The new Sierra will be in showrooms this summer and features some interior upgrades and other new features aimed at making it more a value compared to rivals.